Programme and Report for the World Conference on Artistic Freedom of Expression, Oslo. Printed with foil type on card together with a smaller notebook. Both held together with a printed strap. Over the two days of the conference, more than 50 artists and individuals involved in the arts addressed vital and complex issues concerning artists’ freedom of expression. To honour the histories of the struggle to advance the freedom to make and use art, we placed the artists at the centre of this gathering. 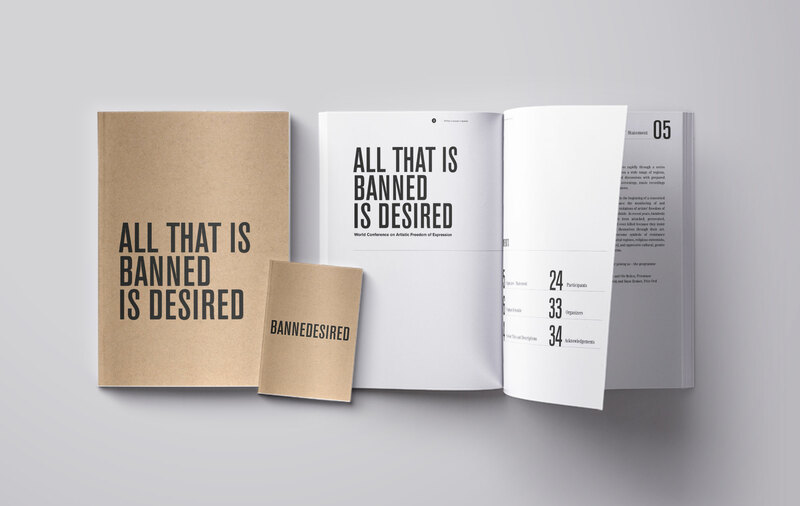 Artists shared both their experiences of censorship and the many strategies developed to claim, defend and advance their freedoms as well as the freedoms of other artists. More info here.